There are two decades-long trends worth examining now that could establish the investing zeitgeist for years to come. The rebound in the SPX/TNX ratio seems to indicate that the economy just dodged a bullet. 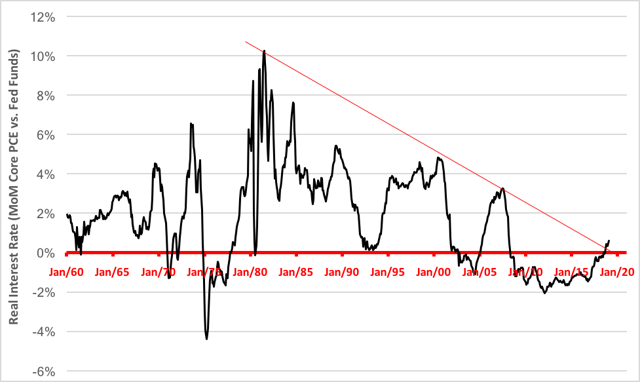 The real interest rate trend, though, points to a more conservative - dare we say defensive? - posture for investors and borrowers going forward. In my trading experience, time horizons - even for position trades - were always relatively short. Trends were measured in hours, days maybe. Never years. That was then. This is now. There are two decades-long trends worth examining now that could establish the investing zeitgeist for years to come. The first is that of the S&P 500/10-year Treasury yield ratio. Back in January, I fretted about a seeming top forming in the logarithmic chart. Since 1982, the ratio's been climbing as prices for both stocks and bonds rose, but that trend looked like it was breaking down. March was a turnaround month, though. Or so it seems. Take a look at the monthly chart and judge for yourself. It appears the bull markets reflected in the SPX/TNX ratio have recovered from the serious wobbles at the top of the year. Owners of balanced portfolios (remember the old 60/40 mix?) should be cheered by this, but follow-through is necessary to keep them smiling. And there's no certainty of that. Speaking of bonds (the "40" in the 60/40 portfolio), there's an interest rate trend that also requires our attention. We've finally emerged from a decade of negative real interest rates - the longest such period since the measurement of the core personal consumer expenditure (PCE) began. Real rates reflect the after-inflation cost of money and PCE is the Fed's preferred inflation measure. Tracking the month-to-month rate of change in the annual core PCE index versus the Federal Funds rate yields the chart below. As you can see, the spread turned positive last fall but, more importantly, it just broke above a 38-year downtrend line. Punching through a trendline just a few ticks above zero may not seem like a big deal, but the climb from the Great Recession's nadir is important nonetheless. Real interest rates shape behavior. When real rates are negative, purchasing power is eroded by inflation. In such situations, funds tend to flow to riskier assets such as stocks to generate inflation-beating rates of return. When real rates are positive, purchasing power grows simply by being passive, encouraging capital to remain in demand deposits and savings accounts. On the borrowing side, negative real rates encourage consumers and businesses to take out loans while higher real rates dampen credit demand. What to make of all this? 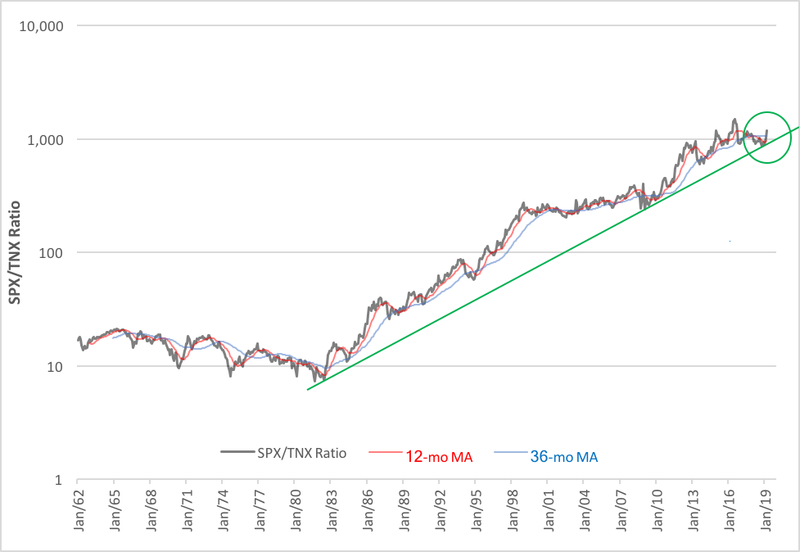 The rebound in the SPX/TNX ratio seems to indicate that the economy just dodged a bullet. The real interest rate trend, though, points to a more conservative - dare we say defensive? - posture for investors and borrowers going forward. In fewer words: "Less risk, not more."